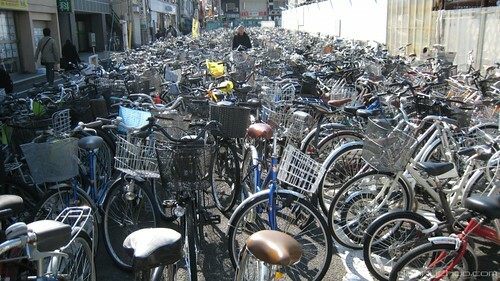 Tokyo is full of bikes. Reportedly there are 15 million registered bicycles. As a matter of fact because of traffic congestions many Tokyoites prefer to travel by bike up to the nearest train station and then catch a train for work. There is a perpetual shortage of parking space near the train stations and consequent increase in illegal parking along the pedestrian walk ways which hampers pedestrian as well as road traffic. Japanese are famous for technological solutions for their problem. Faced with mounting crisis of traffic obstructions due to illegal parking, few railway stations have provided automated multi-level cycle parking. The biggest of such an automatic parking lot is at Tokyo's Kasai Station where 50 robotic lifts are in operation and about 9,400 cycles can be stored in the 15 metre deep basement. Each lift can handle 180-190 cycles and it takes just 23 seconds to retrieve back the cycle. Following videos amply show the working of the automated parking. The first shows only the front end, while the other also gives an insight of the basement of parking station. More info: A very detailed account and some good images of the parking station can be found in http://edogawa.canalblog.com blog by IGAE. IGAE is the gentleman in suit as seen in the first video above. He is also working on a new video and has informed that similar parking lots are under construction at Hirai and Ichinoe stations, also located in Edogawa-ku. There is no one entrance to the bicycle parking lot. In fact, the parking lot is more like several separate lots, a least three of them. ...Oh and there are in total 8 entrances (4 each parking). 2 out of the 8 entrances are for pedestrians only-the steps for the bicyle entrances are slightly different from normal steps. I'm currently working on a new video. Also, new information: Hirai and Ichinoe stations-also located in Edogawa-ku, will have similar facilities under construction shortly. WOW! This was wonderful! A perfect solution for the traffic jams!